CC- thanks for the comments. In looking at this custom closer, I think I need to shorten the neck a little. I'm also afraid that the head may look a bit too large for the body. Hopefully when I add a cloak or cape that helps offsite the size a bit. Cle Tous Enloe is hysterical! I may be able to try that one. I think I've got a police officer body lying around. I was going to say the same thing Brent. Dutch's head is really too fat for most other bodies it seems. I think the neck looks too skinny with that head as well. Personally I think he is too fat to be a young Palpy. Perhaps you could try using an Epsiode I head, and sculpting his hair a bit so it isn't receding so much as well as giving it some color. If that doesn't make him look young enough you could try and sand down some of the wrinkles and the chin a bit. The Jedi is looking pretty good. I never had problem getting either of my Pilot Obi-Wan's to stand. I think that I'd make this Jedi Caucasian looking. With darker skin he'll just end up looking like typho. You can never go wrong with that body though. That Enloe thing is hysterical! And good start on those figures Brent... I am thinking on a young Palpatine, the head from the EU Emperor might really be a good choice over Dutch Vander... nothing wrong with Dutch though. 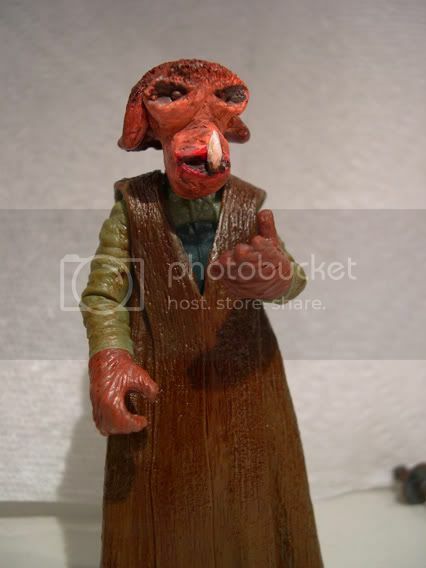 I might have a head of that Palpatine... it was an expensive figure but I'd be willing to trade it it you want to. That head is perfect for a young Palpatine. If there was some way to give him a pointier nose it would be even closer, however as it is the head looks great. Clever! I have a few customs that I worked on this weekend and finally got around to taking pictures. My jawas needed a few droids at there disposal. Hey brentS, you are quicly mastering the casting! Great work in such a short time. I like the use of the Cap P head on the jedi body. Do you see what i meant by how casting makes customizing easier because you dont have to hunt for fodder/wait for fodder to become available? 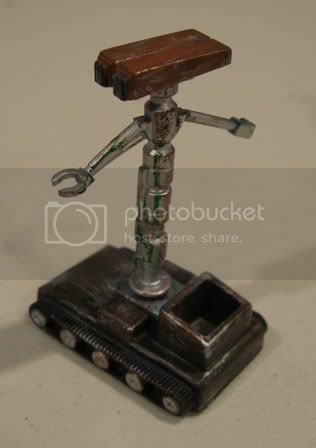 Great work on the gonk too. Excelent paint apps. Very nice update Brent, you've gotten great at this in a short time. Wow. Gonk - hee hee! great idea using that TIE chest panel for the top of him, it's perfect and great painting! 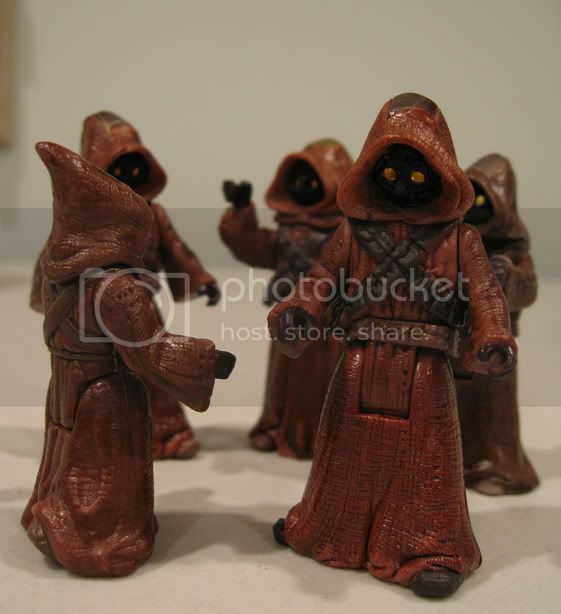 Mate I'm really impressed with your jawas and driods teh paints apps are really really well done I actually like them that much I've pulled my only one jawa and droid out and I'm going to repaint them. well done mate and keep up the great work. 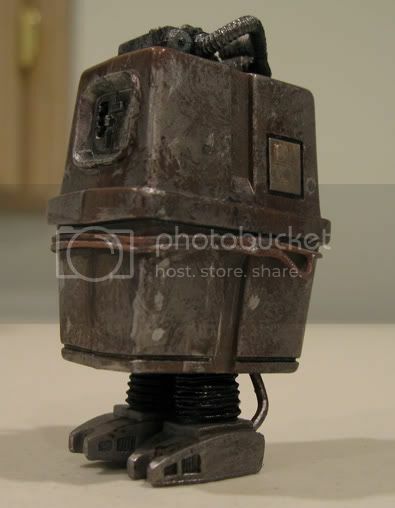 Chewie, Thanks for the comments - The Gonk is my favorite (I've been dying to do one of those since I picked him up). I needed something else to go on top and I didn't want to use a Thermal Detonator I just happened to look through my parts bag and the TIE pilot chest piece fit perfect. 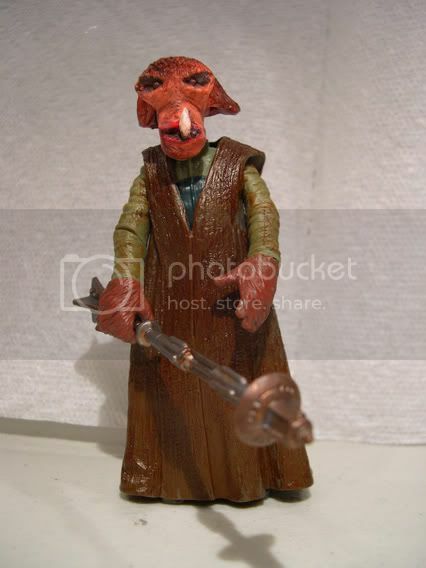 Even though the Gonk is my favorite - I really like how the ASP repaint came out. Too bad the figure doesn't stand very well! Glassman - also thanks for the compliments - I'm not master and as far as whether or not I'm ready to admit that its easier to caste parts that chase fodder, I'm not ready to go there quite yet I still have more mistake pieces than usuable ones. However, I still think that Casting parts is a great option for people. I need to really branch outside of casting heads before I'm able to do a full assessment!! Wow Brent! How did I miss these? Great job on the head casting. Is the problems you've had getting the correct mixture of A and B components correct? How did you finally figure out how to get a good mixture everytime? Beautiful droids there. 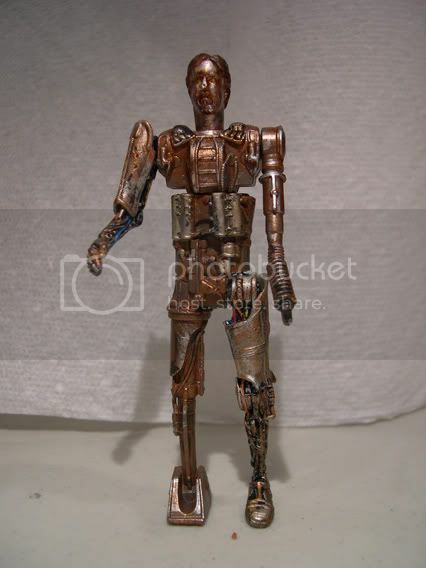 That ASP droid looks incrediable in its new color scheme. 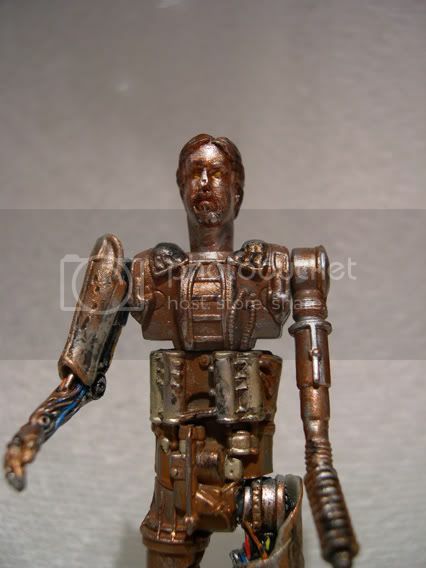 So does the cool power droid. I like the new additions to his head. 1 - poor filling of the mold by the resin - thats what generates the incomplete beards in the Rykrofs. Glassman taught me a trick - try squeezing the mold together and sucking in the resin as you add it. That definitely helps. Also I've used a toothpick to try and push out any air bubbles that gather in these "underfill" areas. 2 - bubbles in the resin - this leads to bubbles of resin on the cast. If you look up at the Rykrof heads, you'll see that the eyese have perfect little spheres sticking out - I'm pretty sure that these are a result of bubbles in the mold. My solution to this was to very carefully pour the first layers on and try to make sure that there are no visible bubbles in the silicon around the problem areas. Another tip that helps both #1 and #2 - when you mix Part A and B together - try to mix slowly but evenly. You want to create as few air bubbles as possible as they just cause problems!!! 3 - Molds breaking - the silicon is quite durable, however as you spoon it on, it really runs and this creates very very thin layers. If the layers are too thin then they will rip as you are demolding either your original or one of your casts. However, it your mold is too thick, its hard to manipulated and demold. I think there is a happy medium in mold thickness when I haven't quite yet mastered. Thats why I echoed Glassman's thoughts - practice, practice, practice. Anyway, hope those tips help. Thanks again for the comments - I'm glad everyone seems like the droids. Those paint jobs are excellent. It's amazing what paint jobs can do to figures like these. 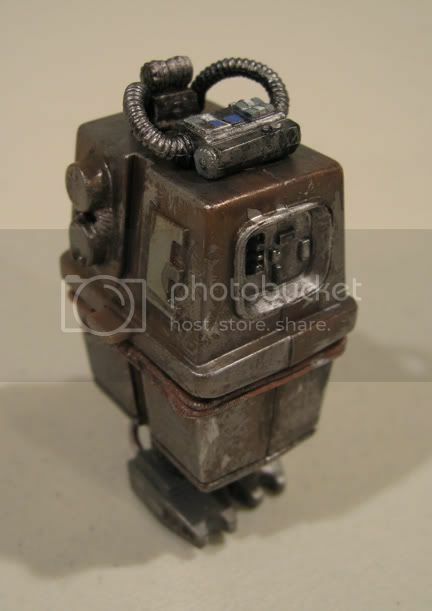 The ASP droid looks like real metal! Prof - thanks for the comments. For what it's worth. I finally named this guy: Semel Odon. He is a hermit that lives on Tatooine. His species is the Shenzeeder. Head - custom sculpted from Super Sculpy and I made a resin cast out of it. Robe - not sure, found in my miscellaneous parts - I'm pretty sure that its Agen Kolars. Staff - Part of a Staff from one of the EPI accessory kits and a thermal detonater. Brent, nice to see an update today as I have a few minutes to check out what's going on around here. That alien is really cool, nice to see you were able to make something that is completely unlike anything we've seen, yet at the same time has a Star Wars look. He's kind of scary looking to be honest. 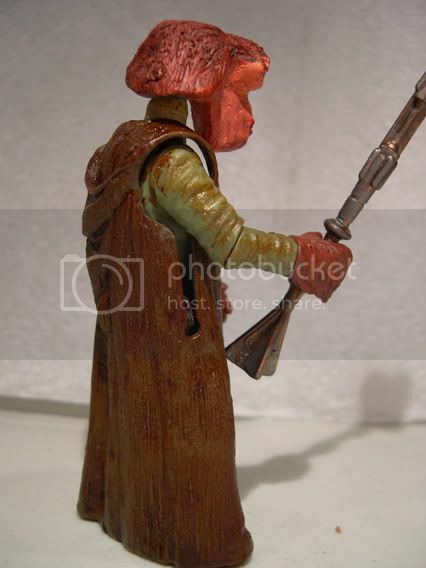 The only suggestion I have is that the arms don't match up great with the cloak, maybe some other arms might be thicker, or maybe even remove the robe (that's a POTJ Plo Koon robe from the looks of it). 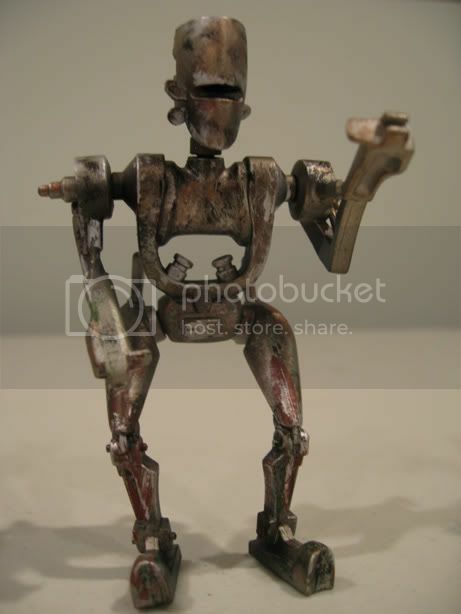 Wow, a Rykrof droid... very differnet and surprising. That's not something I ever would have imagined someone making... ha ha! It's really cool though. You did one hell of a job on mixing parts for it, the wires on the upper leg look great. Wow!